This is very handy for getting a flickr id using only the friendly profile name. 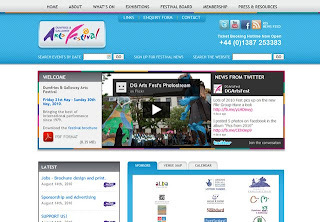 Dumfries and Galloway Arts Festival is in fallow mode just now so we'll be reviewing how to improve the site for the 2011 festival. Current changes have brought the flickr image feed into where the flash feature used to be, until next year's events and highlights are confirmed. The external blog has been replaced with the less formal twitter feed as this is updated more regularly at this time of year. There are also some articles on how to get involved with the arts festival in various capacities.